What is the “creation” to be redeemed in Romans 8? It is not “bugs, slugs and mosquitoes”! What is the “Creation” in Romans 8? 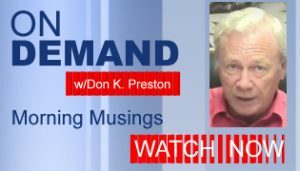 As promised, in this series on Responding to the Critics, after exposing how Lance Conley admitted to totally ignoring the context setting, context controlling tenets of Romans 8:18f– i.e. verses 16-17– I want now to turn to his “exegesis” of Romans 8:19f. In reality, Mr. Conley simply makes one unfounded, unproven assertion after another and calls that exegesis. It is nothing of the sort. It is an imposition onto the text of his preconceived ideas. To make the matters worse, he never seeks to prove his assertions. He just takes it for granted (a priori) that they are true and that the reader will accept his word for it. For I consider that the sufferings of this present time are not worthy to be compared with the glory which shall be revealed in us. 19 For the earnest expectation of the creation eagerly waits for the revealing of the sons of God. Let me point out again that verse 18 begins with the Greek particle “gar” translated as “for.” It means that verse 18 is a continuation of what was discussed in verses 16-17.Likewise, verse 19 begins with that same particle, proving that it is a continuation of the previous verses. But, Conley gave literally not a keystroke about this connection. That means that the manifestation of the Sons of God being eagerly anticipated by “creation” was directly, inseparably tied to “the sufferings of this present time” – the then present, then contemporary “sufferings of Christ” that the church at Rome was experiencing. What did Conley have to say of the “sufferings of Christ” motif and how that impacts a proper understanding of Romans 8:19f? Total silence. And yet, this direct connection of thought, of theme, of motif cannot be ignored and then claim to be doing a proper and serious exegesis of the text. Yet, once more, Conley admitted that he totally ignored verse 16-18! Did Conley say a word about the Shame -V-Glory motif found here? No. He said he could have, but chose not to. And yet, in v. 19-21, that very motif is at the very forefront – it is the foundation – of Paul’s thought and discussion! Their current shame was to turn to glory! Yet, Conley did not see fit to discuss how that would be done, i.e. through the vindication of their then present “now time” suffering and martyrdom. Both before and after man’s Fall, man was still made in the image of God (Gen 1:26-27). Man was formed from the dust of the ground (2:7), and after his fall, the earth became hostile to him (3:17, 18) and he was condemned to a hard life ending in death (3:19). Since man is part of Creation as the Creature, he also finds that since he is from the earth being formed from the dust of the ground, his own body is hostile to him, in that he dies after living a hard life. You will seldom find so many unproven claims and mere assertions without a keystroke of exegesis being offered. Let’s take a look at these assertions. 1. Notice first of all that Conley says of the human body: “Since man is part of Creation as the Creature, he also finds that since he is from the earth being formed from the dust of the ground, his own body is hostile to him, in that he dies after living a hard life. Where do the scriptures say anything remotely resembling this? No where! And you will note that as usual, Mr. Conley did not offer any scriptural proof for his “gnostic” assertion. The irony here is incredible! Conley has repeatedly accused preterists of being Gnostic – a false charge. Gnostics believed that the human body is inherently evil and corrupt. In other words, they affirmed that the human body is hostile to the person! Preterists do not believe that! But, right here, from the keyboard of Mr. Conley, he overtly tells us that man’s own body is hostile to him.” Where do the scriptures say anything remotely resembling this? No where! And you will note that as usual, Mr. Conley did not offer any scriptural proof for his “gnostic” assertion. But, notice the next point, which deepens the irony. Now, if man retained “the image of God” even after sinning, what image of God was being created when they came into Christ and became a “New Creation” (2 Corinthians 5:17). It was patently not a “new physical body.”But, according to Conley’s view, the human body which is hostile to us, is in the image of God! 3. It is abundantly strange (and revealing) that Conley fails (refuses, perhaps) to offer us a linguistic analysis of the word “ktisis” translated as “creation.” He simply claims that the creation is material, physical creation that is under a curse, waiting eagerly, looking for redemption. Such a glaring failure to present a linguistic analysis, when almost the entire argument is built on that word, reveals that Conley knows that his argument will not stand! If Conley hopes to even come close to proving his case he must be able to prove definitively that the material, physical creation is: 1. Under a Curse, and 2. Therefore in need of redemption. But, once again, he did not try, with a single keystroke to prove that assumption. 4. Conley takes it for granted that the creation that is under a curse is material creation. He asserts it, but it is strange that the very verses that he gives do not support his claim. They say not a word about material creation sharing in curse or sharing in deliverance. For instance he offers us Genesis 9:12-16.The problem for Mr. Conley is that this passage says just the opposite from what he claims! It says not one word about creation being under a curse! Literally not syllable! And in fact, it is an incredible promise by the Lord that He would never again destroy His creation! This is the sign of the covenant which I make between Me and you, and every living creature that is with you, for perpetual generations: 13 I set My rainbow in the cloud, and it shall be for the sign of the covenant between Me and the earth. 14 It shall be, when I bring a cloud over the earth, that the rainbow shall be seen in the cloud; and I will remember My covenant which is between Me and you and every living creature of all flesh; the waters shall never again become a flood to destroy all flesh. The rainbow shall be in the cloud, and I will look on it to remember the everlasting covenant between God and every living creature of all flesh that is on the earth. Then the Lord said in His heart, “I will never again curse the ground for man’s sake, although the imagination of man’s heart is evil from his youth; nor will I again destroy every living thing as I have done. “While the earth remains, Seedtime and harvest, Cold and heat, Winter and summer, And day and night Shall not cease. Do you catch it? God had just cursed “the earth.” But, God promised to never do that again! Not only that, YHVH said that “although the imagination of man’s heart is evil from his youth; nor will I again destroy every living thing as I have done.” Do you catch the power of that? No matter how evil man might become, God said that He would never again curse the earth! The curse of the earth– such as it was – was now lifted, never to be repeated! End of story! So, where does Mr. Conley get the idea that material creation remains under the Curse? 1. Any declaration that natural creation is under a curse. 2. That natural creation shares in any kind of curse with man. 3. That natural creation will one day be physically restored to Edenic perfection. More on this later. So, Mr. Conley fails badly. Look again at that word ktisis. Paul was looking forward to the redemption of creation. Now, here is an interesting point: Many of the opponents of Covenant Eschatology vehemently claim that redemption was completed at the Cross. Frankly, I do not know if Conley holds to that view, so I will not ascribe it to him. But, if redemption was fully accomplished, completed at the Cross, then how could Paul be looking for “the redemption of creation” and the redemption of the body? Was that finished at the Cross? Here is one thing that is certain. Mr. Conley has claimed on more than one occasion that God is, even now, transforming creation- and remember, that is material creation, including the human body. I have challenged him – repeatedly – to show us, to give objective, irrefutable proof that material creation– including Conley’s own physical body– is being transformed on a daily basis into the glorious image of Christ. Conley’s response? Total silence! And He (Jesus, DKP) said to them, “Go into all the world and preach the gospel to every creature. (A form of ktisis, DKP) He who believes and is baptized will be saved; but he who does not believe will be condemned. To whom was the Gospel of Redemption to be offered? The answer is simple: To those who could and would believe and obey! Do animals have that capability? No. Can animals believe the gospel and be baptized in the name of Jesus? That is absurd. Do we have a single example of the apostles going out and preaching to the trees, the animals, telling them that one day they would be redeemed? Where is there a single promise that one day, “the birds and the bees” will one day be “sons of God.” Patently, there are no such texts. The reality is that while Jesus commanded to go preach the Gospel “to every creature,” about 30 years or so later, Paul said that the Gospel “has been preached to every creature under heaven” (Colossians 1:23). But, once again, that forces us to ask, if the creation in Romans 8 is the material creation that was to be -is – to be redeemed, then why do we not find a single example of any of the apostles preaching such a thing to the material creation? If it be answered: “Because material creation cannot obey the Gospel” then that answer destroys the contention that material creation will be destroyed. The creation to be redeemed, the creation to be manifested as the sons of God, was the creation that could hear the Gospel of Redemption and obey the Gospel of Redemption by faith! This is totally destructive of Mr. Conley’s presuppositional claims. 1. We have to be reminded that he has admitted that he totally ignored the context setting, context controlling verses that lead up to verse 19f. We demonstrated in the first three articles of this series that Mr. Conley cannot hope or to seriously claim that he has falsified my articles when he admits that he has purposefully ignored the context of Romans 8:19f. That is a fatal admission. 2. Mr. Conley asserts that the human body is “hostile” to us as human beings. Once again, no exegetical support, Just a claim, but, the claim flies in the face of Scripture. The human body is not hostile to us as humans! 3. Mr. Conley makes some purely presuppositional claims about the text, claiming, without offering a word of exegesis in support, that, the “creation” to be redeemed is material creation. 4 . Mr. Conley utterly failed to offer a keystroke of linguistic analysis to prove that “creation” is, or even includes, the physical earth, with “bugs, slugs and mosquitoes.” Without that linguistic proof, his claim can be summarily dismissed as unproven. When you totally fail to prove that the creation is what you claim it is, you have failed to prove your case. 5. He claims that physical creation shares in the Curse with mankind. Yet, to repeat, since he has not proven that the creation is material creation, then his claim that the physical world needs redeeming is unproven. 6. Although he cited some verses to prove that material creation shares in the curse, the reality is that the very verses that he cites say the exact opposite from what he said! You cannot claim that Genesis 8-9 spoke of the Curse of Creation when the text emphatically records the Lord’s words promising that the creation will never again be curse! Conley turns the text upside down. We will have more to say on the redemption of Creation in Romans 8, as we continue Responding to the Critics. We will continue illustrating that Lance Conley has utterly failed to offer an exegesis of the text. He has instead made mere verbal assertions without any proof. That is less than convincing to anyone interested in the truth. In the next installment of Responding to the Critics and our examination of “the creation” I will take a look at the idea, espoused by Mr. Conley, that we are awaiting a physical, literal New Heaven and Earth. 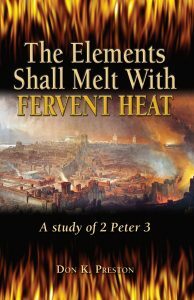 In the meantime, get a copy of my book, The Elements Shall Melt With Fervent Heat, for an examination of the New Creation that was coming. It proves that it was not a renovated, physical earth, but a New Covenant World in Christ. This book is an incredible study of the passing of the elements, proving that it is not material creation that was to perish!